"At one point, you had a strong alliance of six. What happened?," Chen asked. "James. I thought I had a solid alliance with the Soverign Six. Whether James and Sarah were coming after me or not, I couldn't take a shot at James blindsiding me. I felt it was the move to go after him and it went downhill from there," Howie replied. Howie gave credit to The Disciples for beating him in the game and compared their victory to the film 'Revenge of The Nerds'. "We always said they weren't as smart as us. They weren't as physically competitive as we were. I am here and they are still in there. Yeah, I got beat by a Nerd Herd but you all saw the movie. It is coming true again. They played a better game than me and that is why I am here now," said Howie claiming that Janelle is the best overall competitor left in the house and would win the entire game. The force was not with Howie last night on BIG BROTHER 6, as the self-proclaimed "Jedi" could not save himself from the evil clutches of the "Friendship" alliance. The 34-year-old meteorology student, originally from Chicago and currently living in Boca Raton, Fla., met his fate in a tiebreaker vote determined by Ivette and was the eleventh person evicted from the Big Brother house. Immediately following his eviction, Howie was interviewed by host Julie Chen about his distinctive experience in the house. Howie joins Jennifer, Rachel, James and Beau as the fifth jury member to decide who will win the grand prize of $500,000 on the live finale broadcast on Tuesday, Sept. 20. For the last three weeks, tension between battling alliances inside the house could be cut with a light saber. Howie was responsible for Beau's eviction from the house and Ivette was left without a partner. A shift in power put Ivette in control and she nominated Howie and Janelle for eviction with the idea to evict Janelle. But Janelle won the power of veto and Ivette was left to nominate April from her alliance. Although Howie made every attempt to save himself by trying to persuade Ivette that she has a chance to win if she evicts April, the dark side emerged and Howie was swept into a galaxy far away… the Big Brother sequester house. After last night's eviction, the houseguests competed in a competition called "Before or After" to see who would become the next Head of Household. Janelle Pierzina, the 25-year-old VIP cocktail waitress, originally from Grand Rapids, Minn. and currently living in Miami Beach, Fla., won the coveted position. With only two weeks left in the game, BIG BROTHER 6 is down to its final four players, Janelle, Ivette, April and Maggie. The eyes, the ears and the voice of BB-6! Walking through these doors over 1 month ago was a great experience, and it still is. The competitions and games are awesome! Just awesome. Also, no one in America can understand just how complicated and how difficult this game really is without being in the house or being face to face or mouth to mouth with an Ice Cream Clam Sundae. LOL! This show (or game) is a vacation at first. But eventually everything here becomes very real. The stress and pressure mounts just like in the outside world. One loses focus and trust, and it becomes very difficult to talk trash or strategy to someone when you don't know where he or she stands. "Sorry for the bad grammar, but I am under a lot of time and stress"! LOL! I became the HOH (Head of Household) this week, and it was everything I did not imagine. I thought it was a week to relax and that it insured me safety? Well I was right and wrong! HOH is a position of safety for the week. But the achievement and decisions I have to make put a big "Bulls Eye" on my chest. My first night in the HOH Room was great from the outside looking in. Beautiful furniture, spy screen, comfortable king size bed, my own shower and bubble bath, my own dumper and a hot chic (Rachel) in bed with me. Don't worry? Rachel is still untouched goods! LOL! But that was the most stressed out nerve racking time since I have been in the BB-6 House. I could not sleep! The game and people pressure reaches an all time high. People that were your enemies a day earlier are all of a sudden your best friends. Until this week and with the exception to week 1, HOH has been a position of power for a week and out the door the next week in the BB-6 House. So I hope the new trend continues. I cannot compete in the HOH competition this week, and that leaves me or any HOH in weeks past very vulnerable. But hopefully one of my partners in crime will recapture the HOH Key, and then smooth sailing for "one" more week. The Sovereign Six have been broken up but the Sovereign three (Howie, Janelle & Rachel) and possibly the Sovereign 4 with Michael or Kasar will continue to roll. 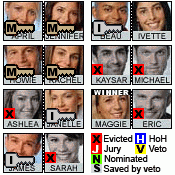 I am glad to be a part of the best looking cast in BB History! LOL! Ash, Mom and Dad (Richie and Michelle)! I love you and I miss you! I am having a great time and I will see you all very soon! PS: What is the highest grossing BB-6 doll? The Jayne, Bo-Bo or the Howie doll? LOL! PPS: The girls of BB-6 are so young, so fresh and so untouched! PPPPS: A guy with my looks, my build and my future economic potential? If I leave the BB-6 House without hooking up, then somebody else should be getting evicted because a serious penalty nomination was committed! LOL! OUR BOY HOWIE: We are starting to think that Howie's mental growth was stunted around the fifth grade. He is obsessed with people's private parts -- this week it was Beau's manhood. Or as Howie called it, "his chocolate pee-pee." We do like, however, that he can't seem to keep his hands off the lady housemates. We also appreciate his honesty. Before Kaysar was back in the house, Howie told the national viewing audience, "Me thinking on my own around here gives me a great headache." The is the group for fans of Howie Gordon of Big Brother 6. Fan website of Howie Gordon of Big Brother 6. Here is howies official myspace made by me. Weekly online entertainment talk show.. Howie is a Red Carpet reporter for us! !